The lowering tool is composed of an auto braking winch and stainless steel aircraft cable with a breaking strength of over 1,700 pounds. The tool is operated by a single user to lower mounted equipment for safe and quick ground level maintenance or replacement. 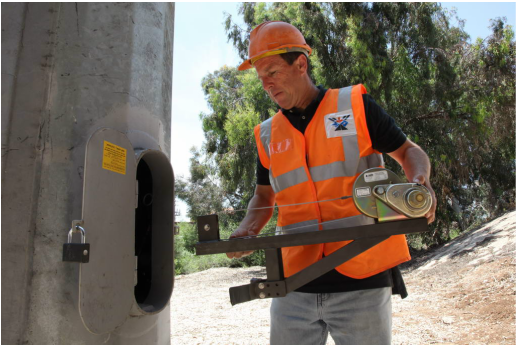 The lowering tool is available in both a lightweight portable design and depending on your application may be permanently mounted in a secured enclosure. The winch may be electrically or manually operated. 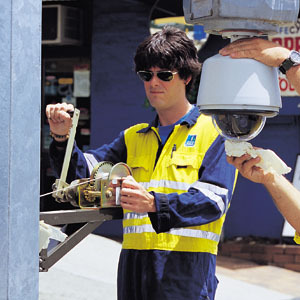 Electrically operated, cameras and other devices can be lowered to ground level in under a minute and raised back into operation in the same amount of time. Designed with a reduction gear to reduce the effort when operating the winch manually, an operator can expect to lower devices from typical heights with the manual hand crank in less than 3 minutes. The portable lowering allows the end user to save money by using a single lowering tool to maintain numerous sites. 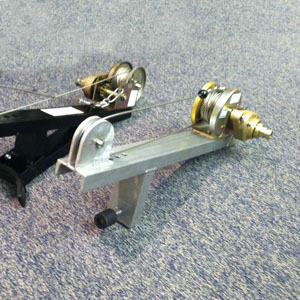 The portable lowering tool is attached during the use of the lowering system (lowering/raising) and the tool is removed afterwards. The portable lowering tool easily fits in the backseat or the trunk of a car and can be operated manually or electrically. 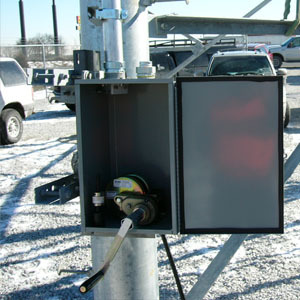 The permanent lowering tool can be mounted inside a lockable enclosure and can be provided at each site/location that a lowering device is installed. This allows instant access to the lowering device operation without the need to install or remove a portable device. 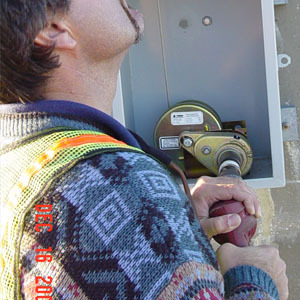 The permanent lowering tool can be operated manually or electrically. In order to reduce the carrying weight and ease the portability, the lowering tool has been upgraded to an aluminum frame for the portable model. This upgrade reduces the carrying weight by more than 10 lbs. (4.5 kg) compared to the original steel framed lowering tool.